Adrian Peterson inches closer to Madden cover; is that a good thing? Vikings RB Adrian Peterson, who has risen from a No. 9 seed and that naysayer Jay Bilas who said he shouldn't even be in this tournament, is among the four semifinalists in voting to become the cover player for the Madden '12 video game. 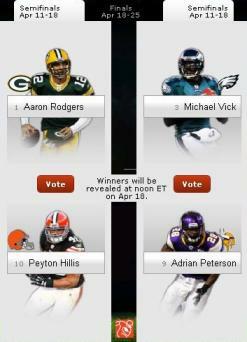 Peterson crushed Drew Brees in the third round to set up a battle with Michael Vick in voting that opened today. If he advances to the finals, he could be in a battle with division rival Aaron Rodgers of the Packers. The question then becomes: Who would you want to win? Sure, in pretty much every Vikings/Packers competition -- even one as innocent and silly as a video game cover -- you would want the purple to prevail if you root for the Vikings. But with the Madden Jinx/Curse well-documented, maybe it wouldn't be so bad if Rodgers prevailed this time (even if Peterson wants to win)? Mid-day talker: Was Todd Richards given enough of a chance with the Wild?